The body of this caliper, which is the very best currently available, is entirely billet and is made up of two pieces which are mechanically connected. Particular attention was dedicated to finding high braking power and stiffness values, obtained tanks to painstaking design, the use of carefully selected raw materials and ultra modern metal machining technology discoveries. In particular sophisticated topological optimisation software was used capable of pointing out to the designer the areas where excess material could be eliminated and vice versa. The hydraulics were the focus of a careful fine-tuning thanks to the use of four 32 mm diameter pistons which allowed a further increase in braking power and modularity specifications. This model implements a surface finish borrowed from MotoGP. In fact, the nickel plating, in addition to giving it an aggressive and attractive look, allowed the already strict machining tolerances to be refined, all to the advantage of performance and operating precision. The brake pads slide in specific guides, machined onto the body of the caliper itself, which have made it possible to eliminate brake pad pins. 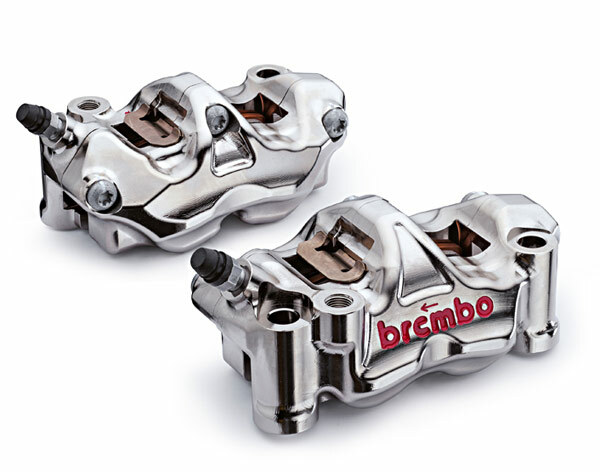 The Brembo logo is embossed and hand painted in classic Brembo Red. The product, provided in a kit, includes sintered brake pads which represent the absolute best quality available on the market today. The kit also contains an instruction manual, a set of Brembo stickers and extremely useful heat adhesives used in racing to control caliper operating temperature, which are indicative of the product’s racing nature.